UPDATE: Mea culpa. One point in the original post was dead wrong. It is possible, contrary to what I wrote below, to get something like a 0.7% difference in annual growth rates with the assumptions he has in the chart below (Drum still exaggerated when he called it 1%). I don't know if the model is valid (I have little faith in any macro models) but I was wrong on this claim. Using the 0.7% and working more carefully by quarter we get a cumulative GDP addition a bit lower than the cumulative debt addition. There is still obviously a reasonable question even at a multiplier near 1 whether $1 of economic activity today is worth $1 of debt repayment plus interest in the future. I am not a believer, obviously, in cyclical tweaking of the economy by the Feds. To my thinking, the last recession was caused by a massive government-driven mis-allocation of capital so further heavy-handed government allocation of capital seems like a poor solution. But what really drives me crazy is that most folks on the Left will seductively argue that now is not the time to reduce debt levels, implying sometime in the future when the economy is better will be the appropriate time. But when, in any expansion, have you heard anyone on the Left say, "hey, its time to reduce spending and cut debt because we need the fiscal flexibility next time the economy goes wrong." I will leave the stuff in error below in the post because I don't think it is right to disappear mistakes. For transparency, my spreadsheet reconstruction both confirming the 0.7% and with the updated numbers below is here: reconstruction.xls. I see that Macroecomic Advisors has produced a comprehensive estimate of the total effect of bad fiscal policies. Their conclusion: austerity policies since the start of 2011 have cut GDP growth by about 1 percentage point per year. Something seemed odd to me -- when I opened up the linked study, it said the "lost" government discretionary spending is about 2% of GDP. Is Drum really arguing that we should be spending 2% of GDP to increase GDP by 1%? Of course, the math does not work quite this way given compounding and such, but it did cause me to check things out. The first thing I learned is that Drum partook of some creative rounding. The study actually said reductions in discretionary spending as a percent of GDP reduced GDP growth rates since the beginning of 2011 by 0.7% a year, not 1% (the study does mention a 1% number but this includes other effects as well). Note that in the quarterly data, only 2 quarters appear to show a 0.7% difference and all the others are less. I understand that compounding can do weird things, but how can the string of numbers represented by the green bars net to 0.7%? What it looks like they did is just read off the last bar, which would be appropriate if they were doing some sort of cumulative model, but that is not how the chart is built. If we interpolate actual values and are relatively careful about getting the compounding right, the difference is actually about 0.45%. So now we are down to less than half the number Drum quoted see update above (I sent an email to the study author for clarification but have not heard back. Update: he was nice enough to send me a quick email). So let's accept this 0.45% 0.7% number for a moment. If GDP started somewhere around 16 trillion in 2010, if we apply a 0.45% the quarterly growth numbers from his chart, we get an incremental economic activity from 2011 through 2013:Q2 of about $333 billion. So now look at the spending side. 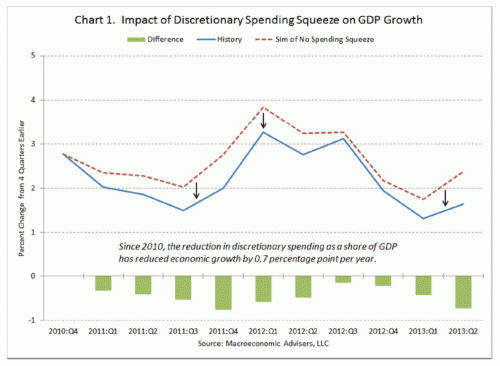 The source says that discretionary spending fell by about 2% of GDP over this period. From the graph above, it seems to bite pretty early, but we will assume it fell 1/12 of this 2% figure each quarter, so that by the end of 2013 or beginning of 2014 we get a fall in spending by 2% of GDP. Cumulatively, this would be a reduction in spending over the 2.5 years vs. some "non-austere" benchmark of $388 billion. Economists agree that failure to shrink prospective deficits and debt will bestow significant economic consequences and risks on future generations. Federal deficits drive up interest rates, “crowding out” private investment. If government borrowing supports consumption (e.g., through Social Security and major health programs) rather than public investment, the nation’s overall capital stock declines, undermining our standard of living. The process is slow but the eventual impact is large.2 In addition, accumulating debt raises the risk of a fiscal crisis. No one can say when this might occur but, unlike crowding out, a debt crisis could develop unexpectedly once debt reached high levels. I guess we have pretty much given up on the >1 multiplier, huh? Beggaring our children for incremental economic growth today is a risky enough strategy, but particularly so with the implied .66 .85 multiplier here. This is not the first time Drum has taken, uh, creative data approaches to cry "austerity" during a mad spending spree. The mechanism for this recession seems pretty clear: A bursting asset bubble has left both lenders and consumers over-leveraged, so everyone is trying to reduce their debt. This means less consumer spending for a while, as well as tighter lending. Running a small business over the last few months, I have found that the credit we need to expand is not unavailable, but is harder to get. Banks and individual investors are asking for tougher terms, more collateral, and are being pickier about what they will fund. All totally normal and unsurprising (though stressful if you are in the middle of it). The one thing small borrowers like myself have in our favor: Eventually, lenders have to lend and investors have to invest. They simply cannot just put all their money in the vault or the mattress. The money they hold, in deposits and CD's and whatever else, has a cost, as do their operations staff. These costs have to be covered. The only way they have of doing so (short of switching businesses) is to put their free cash to work. They have to lend it and invest it. It's a useful thing to remember in this world dominated by the cult of victimization and helplessness -- that even as a borrower, you have power. Banks need you as much as you need them. So, what does the government do now? Well, very soon, the Obama administration is going to be marketing to banks and investors an additional trillion dollars of government bonds backed by the full faith and credit of the US taxpayer as an alternative investment to funding my business. Uh, yeah, that's sure going to help. On Thursday, I had some power with investors. Given time, they were going to have to consider my business as a place to put their money to work. Now, however, everyone can run out and park their money in a trillion dollars of new government securities that have features attached I can never match (e.g. the ability to print money or grab it at gunpoint to repay the loans). But don't worry about me, I will figure it all out. I just will not grow the business or hire as many people as I thought I could given new investment capital. But everything will be fine for the country as a whole as long as you believe that Nancy Pelosi and Barack Obama, with their vast business experience, will invest this trillion dollars more productively than I, and other like me, would have.